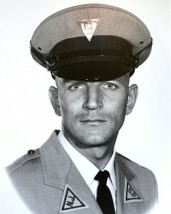 While at the ending months of my police academy, I attended officer Werner Foerster funeral in New Jersey. My badge # was 2633 and Werners was 2608. I later made Sergeant, #582 and specialized in drunk driver enforcement and was assigned to motorcycle for many years with Highway Patrol. I also spent a year in Washington DC on an assignment by the Governors traffic safety committee. I believe I'm a distant cousin of Werners, although I did not know him. My branch of the Foerster family arrived at Ellis Island in March of 1907 and my grandfather, Herman Foerster opened a bakery with his brother Otto Foerster. Otto later owned a large bakery in BergenField New Jersey. I often think of Werner and how he died at the hands of an animal who is still free. I also wonder about his family and how they managed without him. God rest brother, we still think of you! I was only 6 years old when your watch ended and growing up in the motorcity. I did not get my wish to be a police officer until 2 years ago. There is not a prouder profession that I know of. Rest in peace brother and watch over us as we do our best. See you on the other side. Rest in Peace knowing that no person can avoid The Lord's justice. I was 12 years old, and sound asleep that night, until the roar of the engines (that drowned out the sirens)from police car after police car flashed by my house on route 18. I knew something bad had happened, and I was scared--until a search party of four officers came door to door and checked every building in my apartment complex for the fugitives. I knew then just how important police officers are, special individuals, like the trooper who lived around the corner and the city cop down the block--all part of what is right in this world. I had to become part of that fraternity. Werner is watching over us. God's Blessings always to his friends and family. THERE IS NOT A DAY THAT GOES BY THAT A DON'T HAVE THE IMAGE OF THIS ANIMAL NOT ONLY IN MIND BY ALSO ON MY MY VEHICLES DASHBOARD. REST IN PEACE TROOPER. YOUR WATCH HAS ENDED. I PROMISE YOU SHE WILL BE BROUGH TO JUSTICE. The day is finally here when you will be honored by the state of New Jersey for your sacrifice. After 30 years, the stretch of road over the NJ Turpike where you were brutally murdered will be dedicated and named after you. We still patiently wait until the day when all of those responsible for your death see justice. Until that day, you are in the thoughts and prayers of everyone in New Jersey and the rest of the country. you are still loved and missed by those who knew you. you and the sacrifice you made will never be forgotten. Rest in peace brother.......May those brutal criminals responsible for these murders of the "best of the best" be brought to justice and damned to hell! Here it is 29 years later and I can remember the day of May 2, 1973, lke it was yesterday. I was only 6 years old and I didn`t live far from the shooting.I was very sad when I heard that Trooper Werner Foerster was killed by a woman and extremely upset when she escaped from prison and hasn`t yet been caught. I am now 35 years old and travel the turnpike everyday to go to my assigned area and always think on what happened to Trooper Foerster and his family that day. Restin Peace brother and because of you I followed your footsteps in law enforcement, As long as I live I will never forget that you gave your life for the people of the State of New Jersey.